Please click on the map if you would like to open a larger version. Once open, you can left-click again to enlarge it further. The results are consistent with those found in other parts of the world. For example, NOAA (National Oceanic and Atmospheric Administration) has reported that 2012 was the warmest year on record “by a wide margin” for the contiguous United States. The length, extent and severity of the heatwave were unprecedented since records began. 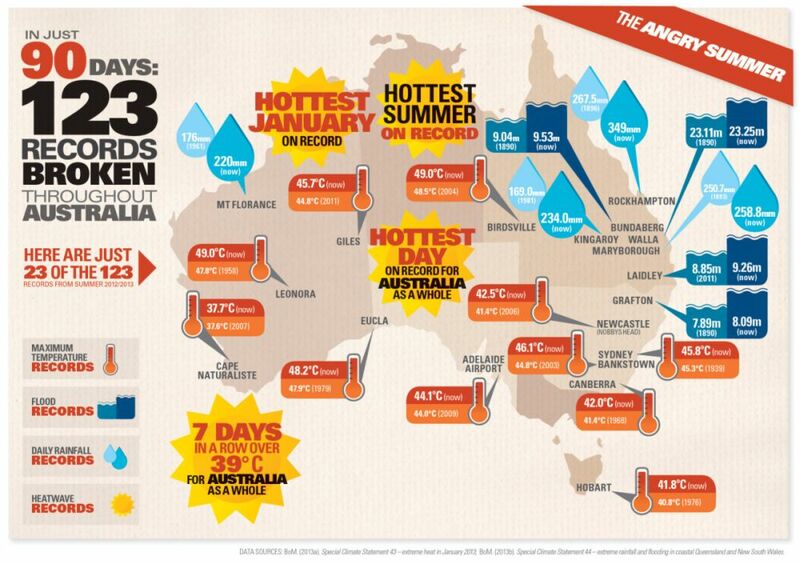 For seven days running, from 2–8 January 2013, the average daily maximum temperature for the whole of Australia was over 39 °C (102°F), easily breaking the previous record of four consecutive days over 39 °C. There have only been 21 days since records began in 1910 where the average maximum temperature across Australia has exceeded 39 °C; eight of those days happened in the 2012/13 summer (2–8 January and 11 January 2013). In the first weeks of January, dangerous bushfire conditions occurred in many areas across Australia with major bushfires flaring in Tasmania, New South Wales and Victoria. Between 22 and 29 January 2013 extreme rainfall occurred over the east coast of Queensland and the New South Wales coast north of the Illawarra. The heavy rainfall was the result of former tropical cyclone Oswald moving south, just inland of the coast. Extreme rainfall from former tropical cyclone Oswald triggered severe flooding in many areas within 200 km of the Queensland and far northern New South Wales coastlines. In addition to heavy rains, the system brought strong winds, storm surges, high waves and tornadoes. In contrast to what was happening in the north, Victoria and South Australia had the driest summer in decades. Since mid-2012 much of Australia has been drier than usual. The report states that the IPCC (Intergovernmental Panel on Climate Change) has reported a likely net increase in the number of heavy precipitation events globally, although there is a stong regional variation in the trends (as typified by events in Australia). The following image from the Climate Commission’s report describes the connection between a warming climate and increasing rainfall. 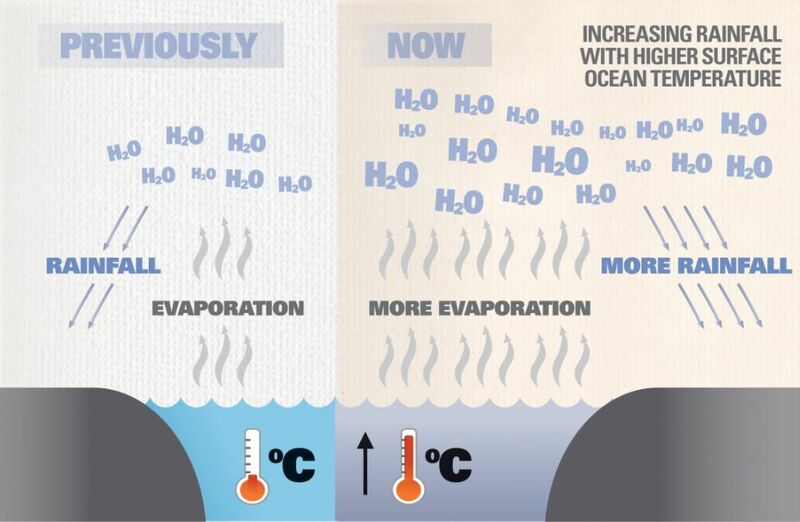 Higher ocean surface temperatures cause more evaporation, leading to more water vapour in the atmosphere. That, in turn, leads to more precipitation. The hot weather continued into March, with more records broken. In Melbourne, a new record of nine consecutive days with maximum temperatures above 30°C (86°F) was established. Each of the previous spells of eight days had occurred in January or February, and the most recent of those occurred in 1961. Melbourne also experienced its warmest March night since records began, with a minimum temperature of 26.5°C (79.7°F). Does everyone acknowledge what’s happening? It would be interesting to know if Ms Hutchinson has changed her position since that time. 88 viewed climate change as a potential future loss driver, even though scientific assessments such as the recent IPCC Extreme Events report and draft National Climate Assessment emphasise that climate change is already amplifying extreme events that lead to insured losses. The findings may have disappointed the CEO of major global reinsurer, Munich Re, Nikolaus von Bomhard. In December, 2009, he said, “Climate change is a global problem and a challenge for humankind. If the players do nothing but pursue their national interests, we are headed for a climate catastrophe”. The Climate Commission’s report says it is virtually certain that extreme hot weather will continue to become more frequent and severe around the globe, including Australia, and that the frequency of heavy rainfall will also increase. Do you have any thoughts? If so, please record them in the “comments” section below.